Optoma Corporation is a company that specializes in theater equipment - projectors, speaker systems, and so on. There's no shortage of compact projectors that run Android, and now Optoma is throwing its hat in the ring. The company just announced the 'UHL55,' which not only runs Android, but also works with Alexa and Google Assistant. The UHL55 is fairly compact, measuring 8.6 inches (21 cm) across and 5.3 inches (13 cm) tall. Despite its small size, the projector has a maximum resolution of 4096x2160, and can display an image 30-200 inches (0.8-5 meters) across. That's quite an upgrade from typical consumer models, like the 720p Anker Nebula Mars II. As for software, the UHL55 runs an unspecified version of Android, with a "growing list of Smart TV apps." Netflix, YouTube TV, Spotify, and BBC News are some of the supported applications. You can use Alexa or Google Assistant to turn the projector on/off, change the volume, switch the inputs, and control media playback. All that comes at a steep price - the UHL55 will cost $1,499. It's not available to purchase yet, but Optoma says it will be sold at Best Buy, Amazon, Newegg, B&H, Fry's, and other retailers. More information about the UHL55 can be found here. 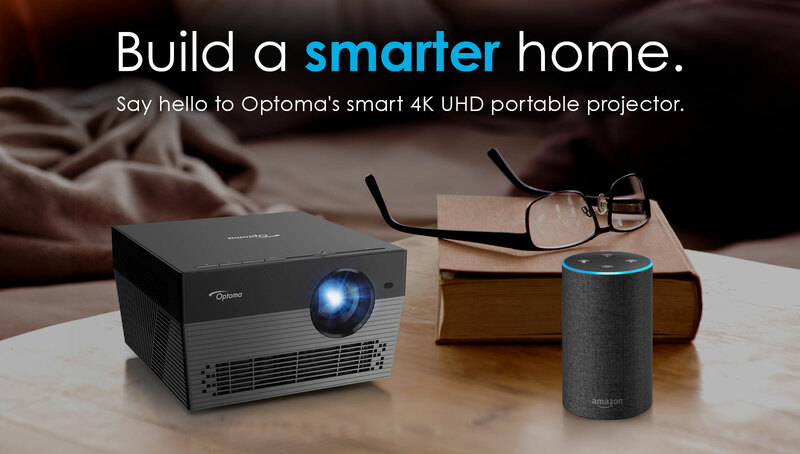 Fremont, Calif., September 6, 2018 – Optoma, a world-leading manufacturer of video and audio products, today launched a series of innovative projectors designed to deliver new and exciting home theater experiences. The Optoma UHL55, LH150, LV130 and ML1050ST deliver powerful punches in a small, compact form factors, offering everything from voice-assistant compatibility, impressive image performance, and complete mobility for optimal entertainment experiences. The Optoma UHL55 is a compact and portable 4K UHD smart projector designed to play 4K content any time, anywhere. With Amazon Alexa and Google Assistant compatibility, an integrated Android OS and 4K UHD HDR media player, this projector powerhouse combines the latest in voice and display technology to produce high quality entertainment wherever you go. Voice compatibility allows for intuitive voice control and seamless smart home integration, and lets users power the projector on and off, change volume and input source, and control the 4K UHD HDR media player. In addition to its voice innovation, the UHL55 also features auto focus and auto keystone correction for easy place and play, and includes NuForce stereo audio to provide crisp sound for movies and music. In a first for the company, the projector offers an integrated Android OS with a growing list of Smart TV apps, including Netflix, Youtube TV, Spotify, BBC News and others, as well as the Optoma Marketplace app store for easy access to Internet streaming services and additional entertainment options. The Optoma UHL55 is being offered at $1,499. Like the Optoma UHL55, the Optoma LH150 and LV130 combine form factors with stunning image quality, but also have a built-in battery for complete mobility to bring premium projection on the road. Built with a diverse base of on-the-go users in mind, these new projectors offer a range of features to provide customers with a diverse selection of options, delivering impeccable quality and functionality for in-home and on-the-go use. Optoma LH150 is a bright 1,300 lumen 1080p LED projector designed to produce clear and vibrant images in any setting. Powered by a 12,000 mAH battery, the Optoma LH150 delivers up to 2.5 hours of viewing time, and its RGB LED light source provides up to 30,000 hours of life for long-lasting performance. Bluetooth audio connectivity enables compatibility with wireless speakers to add big sound to every viewing experience, and four corner geometry correction allows for flexible placement. With an optional wireless USB adapter, the projector is also equipped for wireless presentations and easy screen mirroring with HDCast Pro for iOS and Android mobile devices. ESP pricing is $899. Optoma LV130 is an ultra portable 300 lumen WVGA projector designed to project stunning images of up to 80 inches. Equipped with a large 6,700 mAH battery, the Optoma LV130 delivers up to 4.5 hours of viewing time in palm-sized form factor. The projector also features an HDMI input with MHL 2.2 for compatibility with notebooks, mobile devices and gaming consoles, and the integrated 1.0-amp USB port connect to wireless streaming video devices and charges mobile devices. With up to 30,000 hours of light source life over 30,000 hours of operation, a built-in speaker and an impressive 100,000:1 contrast ratio, this projector is equipped to take large screen video entertainment anywhere. It is available for an ESP of $279. Optoma ML1050ST is an ultra compact 1,000 lumen short throw WXGA projector that can produce large 100-inch images from a few feet away. Small enough to fit in the palm of your hand, the Optoma ML1050ST comes equipped with an auto focus lens for seamless setups and its RGB LED light source guarantees up to 30,000 hours of life for reliable operation. The integrated PC-free media player, image viewer and document reader allows users to display office documents, PDFs and images from micro SD cards and USB storage devices, and an optional wireless USB adapter enables HDCast Pro connectivity for wireless screen mirroring with Android, Mac OS and Windows devices. ESP pricing is $649. The Optoma UHL55, LH150, LV130 and ML1050ST are currently available for pre-order at B&H Photo, and will be shipping later this month to Optoma authorized dealers and distributors including Amazon, Fry’s, Beach Camera and ProjectorScreen.com. For more details on the new products or the company, please visit: www.optoma.com. Along with its new compact projectors, Optoma is also launching two new high definition 1080p projectors aimed to provide the ultimate home entertainment experience. 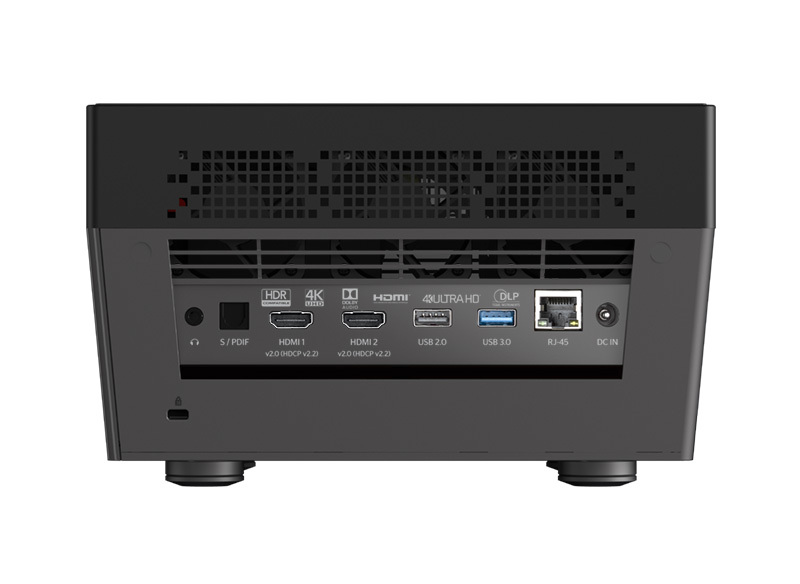 The Optoma HD27HDR is a 3,400 lumen 1080p HDR home theater projector that accepts 4K and 1080p HDR signals and features an enhanced gaming mode, reducing input lag to 16ms for lightning-fast responses when connected to the latest HDR-ready gaming consoles and PCs. The Optoma GT5600 is a 3,600 lumen ultra short throw projector that features a 0.25:1 throw ratio, producing a large and precise 100-inch image from just inches away. Designed with flexibility and reliability in mind for long-lasting performance, the Optoma HD27HDR features vertical keystone correction and a 1.1x zoom, and the Optoma GT5600 offers four corner geometry correction for easy placement and projection onto virtually any surface. The Optoma GT5600 and HD27HDR are now available for pre-order at B&H Photo at an estimated street price of $1099 and $649, respectively, and will be shipping later this month to Optoma authorized dealers and distributors including Amazon, Fry’s, Beach Camera and ProjectorScreen.com. Optoma today also announced the availability of its Optoma UHD51ALV, an upgraded model of its award-winning Optoma UHD51A, which offers higher brightness for enhanced 4K UHD performance in environments with ambient light. On the heels of announcing the projector’s Google Home compatibility this past June, the Optoma UHD51ALV features an RGBWRGBW color wheel and 3,000 lumens of brightness to produce brighter, more spectacular images with rich lifelike color and contrast for immersive experiences. The Optoma UHD51ALV is currently available for pre-order at B&H Photo at an estimated street price of $1799, and will be shipping later this month to Optoma authorized dealers and distributors including Amazon, Fry’s, Beach Camera and ProjectorScreen.com. Optoma Technology is a world leading designer and manufacturer of award-winning video and audio products for home entertainment and theater, ProAV and business. With a focus on premium quality and functional style, products are designed with the end-user experience in mind. Optoma and NuForce products deliver stunning crystal clear images and exceptional sound with ultimate reliability. Optoma Technology is part of The Optoma Group, which has continental headquarters in the U.S., Europe, and Asia. For more information, please visit: www.optoma.com. What would you change in Android 9 Pie?